Auxiliary University Programs cadet JD DeCastra sudying a nautical chart at Coast Guard Station Daupin Island. U.S. Coast Guard photo. For university students looking for ways to serve their country while pursuing a degree, finding a fit in the U.S. Coast Guard can be tough. With limited programs available, and no formalized ROTC, students wishing to learn more about America’s Coast Guard often fall short. Cue the Coast Guard Auxiliary. Using their all-volunteer force, they established a tailor-made program for college students interested in serving. 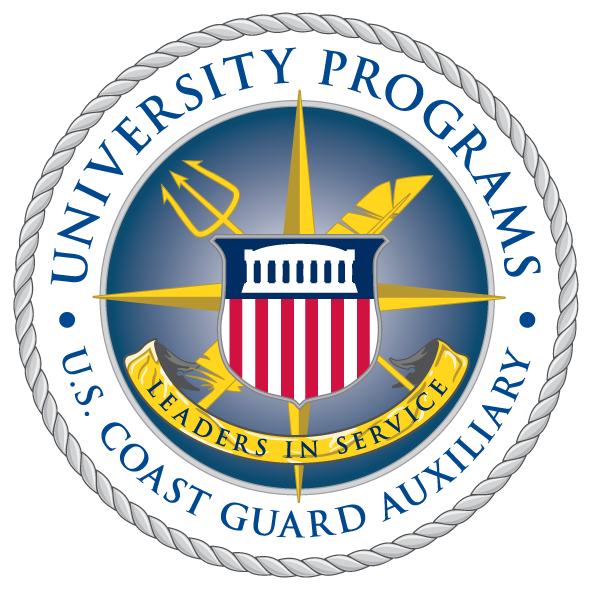 Auxiliary University Programs, organized by a group of Auxiliary leaders, prepares students for success in service and leadership to their community and country with real-world Coast Guard experience. Auxiliarst Jake Shaw serves as one of three branch assistants in the Auxiliary University Programs. U.S. Coast Guard photo. One of the Auxiliary members leading the charge to encourage university students to get involved is Jake Shaw. Shaw serves as one of three branch assistants in the programs, leading the education branch. In his role he gets to interact with prospective students, current Auxiliary members and graduates who have gone on to serve in active duty or reserves. Just as members of the Auxiliary come from a wide range of backgrounds, Shaw seeks to capitalize on the unique skills and traits college-aged members of the university program bring to better the service. In the coming year, Shaw and the program’s leaders plan to broaden their scope in working with students and their specialized backgrounds, including information technology, education and public policy. Shaw and his team hope by keying in on university student’s skills, the Coast Guard can achieve organizational goals, particularly in mission execution, mission support and force readiness. Like their Auxiliary counterparts, participants in the program – called cadets – can serve ashore, on the water or even in the air. Cadets have worked at small boat stations, attended aviation-training sessions, educated recreational boaters and even worked to rebuild their community in tornado recovery efforts. Auxiliary University Programs cadet Cassandra Smith at the helm of a response boat at Coast Guard Station Dauphin Island. U.S. Coast Guard photo. There have been a number of university program cadets who have gone on to serve in the Coast Guard and other branches of the service, which Shaw admits is quite a track record for a program only five-years-old. Many students join as active duty members of the Coast Guard. Others pursue careers in the maritime or homeland security community with a broader understanding of the Coast Guard and public service. There is no service obligation so all students have the opportunity to apply their training and experience as successful leaders in whichever career they choose. For Shaw, the time he puts in to the program and the countless hours he invests in each student is all worth it. To him, these students aren’t just the future of the service, but the future of our country. Auxiliary University Programs Unit Auburn cadets honoring retired Sgt. Maj. Bennie Adkins, U.S. Army Distinguished Cross Recipient, at East Alabama Medical Center, Ala. U.S. Coast Guard photo.